With the outbreak of war in 1914, best friends Wally and Roy, and new mate Tom, are among the first to enlist. But their great adventure soon turns to disaster. The day after the landing at Anzac Cove on 25 April 1915, more than 2000 of their fellow Anzacs are dead and the bold attempt by the Allied commanders to knock the Turks out of the war becomes a stalemate. As the Gallipoli campaign drags on, Wally, Roy and Tom find themselves locked in combat with a formidable enemy, a ferocious landscape, flies, fleas, cold and disease. 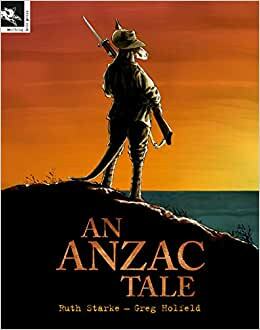 An Anzac Tale is a beautiful and thought-provoking graphic novel that skilfully introduces the events of the Gallipoli campaign. Ruth Starke is one of SA's most successful children's writers, with over 20 titles published since she began writing in 1992. Many of them have won or been shortlisted for national awards, including the much acclaimed NIPS XI (CBC Honour Book), Orphans of the Queen (shortlisted for both the 2005 NSW and Queensland Premiers' Awards); Stella by the Sea (shortlisted for both the CBC Younger Book of the Year and the Queensland. Premier's Award) and Noodle Pie (winner of the Book of the Year Award Speech Pathology Australia). Armistice is a companion to her award winning 2015 title, My Gallipoli which won the 2015 NSW Premier's Young People's History Prize.